Ralph of Diceto (d. 1202) gained an education in Paris, and became a dean of St. Paul's Cathedral in 1180. 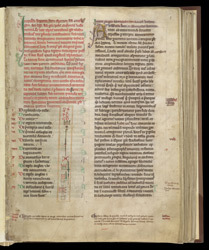 He wrote two historical works covering his lifetime, both contained in this manuscript, which was owned by St. Albans abbey in the Middle Ages. The lower half of the left column is occupied by a key to understanding a series of twelve visual indexing symbols, which function rather like computer icons: they are small easily recognised mnemonic symbols, which are placed next to passages of text to give an indication of its content. Thus, a crown represents the anointing of a king, a sword represents the dukes of Normandy, and a crown being grasped by two hands from opposite sides represents the arguments between King Henry II and his three sons.